After the Civil War in 1865, the country looked west. Record numbers of cities grew up and prospered along the shorelines. Omaha was no exception. 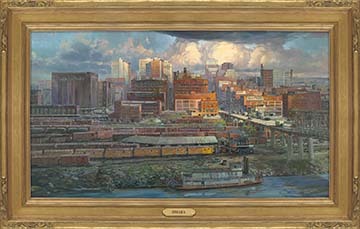 The premise of Omaha Morning is the diminishing importance of the river as a form of transportation, and the rise of the railroad. 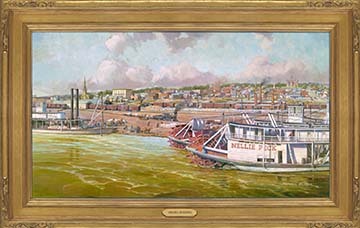 The vessels shown in the painting were known as Missouri River mountain boats. As quoted by author Stephen Ambrose, "Next to winning the Civil War and abolishing slavery, building the first Transcontinental Railroad from Omaha, Nebraska to Sacramento, California was the greatest achievement of the American People in the nineteenth century." Artist Enhanced Giclées on Canvas: 40" x 25"
Omaha NE, and may only be ordered through ARTicles Gallery. Frame denotes print available as Giclee on canvas The historical artist looks for salient points in American history to create a departure point between research and the painting. The gathering clouds that dominate the sky are a metaphor for what was to lie ahead. This Midwestern town, asleep on the prairie, will wake to the storm of war in Europe and the South Pacific. The name "Aksarben" still endures. The old freight yards are now the site of Heartland of America Park. There is no soot on the snow from the steam engines and they probably do not deliver milk to your home at 6:00 a.m. anymore.